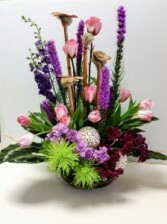 This beautiful sympathy arrangement represents the commencements of new beginnings. 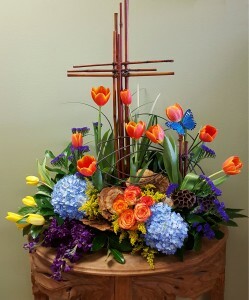 La Mariposa designs are custom made and substitutions may be necessary due to availability of flowers. Wonderful way to commemorate a loved one with a custom design depicting their favorite flowers, hobby or treasured pastime. We specialize in 3D designs! Call for details and pricing. Wow them with this colorful masterpiece. 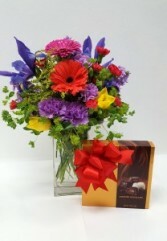 It's designed to bring a smile to that special recipient. In an effort to ensure that your arrangement arrives on time, we reserve the right to substitute any flowers and containers of equal or greater value. In making substitutions, we take great care and consideration in selecting flowers that will meet or exceed the expectations of both the arrangement giver and recipient.